Westerly, the hilarious co-operative westward expansion board game, is back and better than ever. We here at AE games have been working hard to find a way to get you the highest quality game at the lowest possible price. And this time, it looks like we've found it. In Westerly, you and a group of like minded pioneer folk will brave your way across the content. By working together, making smart decisions and keeping your fingers crossed for good luck, your group may just make it to California. It's a brand new ridiculous tall tale every time you play. NOTE: As of April 24, 2014, the third Kickstarter for Westerly had not successfully funded. However, due to the interest in the game, Analog Evolution Games partnered with a prototyping company called The Game Crafter to make the game available for purchase as of May 4. Everytime I pull this game out I get nothing but laughs and questions on where to get it. One of my favorite games that has now been lent out over a dozen times. Easy to learn fun game. Can run a little long but easy to adjust the time by shortening the number of tiles needed to get to the end. Love that even when you die you still get to play but the newer characters make the trip a bit harder as they join with “baggage”. Wish it wasn’t a print on demand game. Because of that it was a bit pricey and the components aren’t the best. 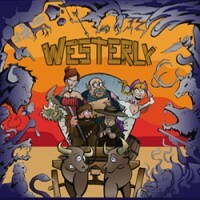 Add a Review for "Westerly"